It might be called the “Gateway to the West,” but St. Louis is opening up more than just the left side of the country. As one of the first nodes in the Teen Science Café Network, the Gateway Teen Science Café has been bringing STEM to St. Louis for years. This October we shine the Spotlight on Kerry Stevison. To start, can you tell us in a nutshell about your Teen Café program? What’s special or unique about it? The Saint Louis Science Center Program is part of the Gateway Teen Science Café node in the St. Louis area, which also consists of the Academy of Science-St. Louis and Cahokia High School just across the river in Illinois. Our teen leaders come from a variety of audiences, including homeschoolers, teens from our Youth Exploring Science (YES) Program, and teens from area schools. One way in which we are unique is that those teen leaders who belong to the YES Program are also Science Center employees. 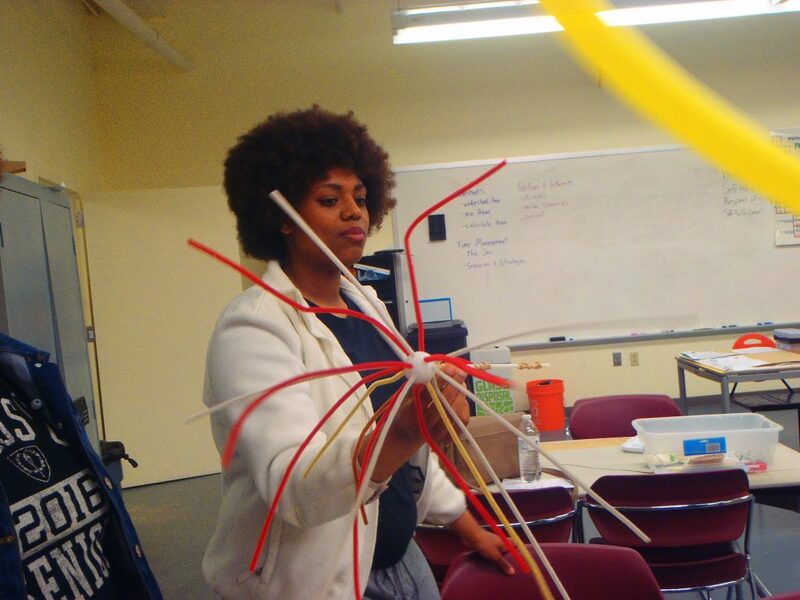 All YES teens are employed by the Saint Louis Science Center in galleries, as educators, and in other capacities such as the Teen Science Cafés. In addition, our TSC program is based out of the home building for the YES Program, the Taylor Community Science Resource Center. This gives us the advantage of having a site that was designed with teens in mind, with a large, open layout conducive to teens working together in a non-traditional atmosphere, including large glass windows, concrete floors, multiple translucent-walled rooms, and mini makerspaces for teens. I have a degree in Biology, but I didn’t know what I wanted to do after college. So I worked in the adoption center of the Humane Society of Missouri for a while, and I also worked as a gallery assistant doing Amazing Science Demos and interacting with visitors at the Saint Louis Science Center. Eventually, I discovered a Museum Studies degree program, which sounded like an ideal match for my interests and background, so I went back to school and got a Master’s. While taking classes, I interned at the Science Center again and eventually ended up working with the Collections Department and then the YES Program. I was introduced to the Teen Science Cafés by a co-worker three years ago and have been doing teen science cafés ever since. Our program is based at the Saint Louis Science Center. 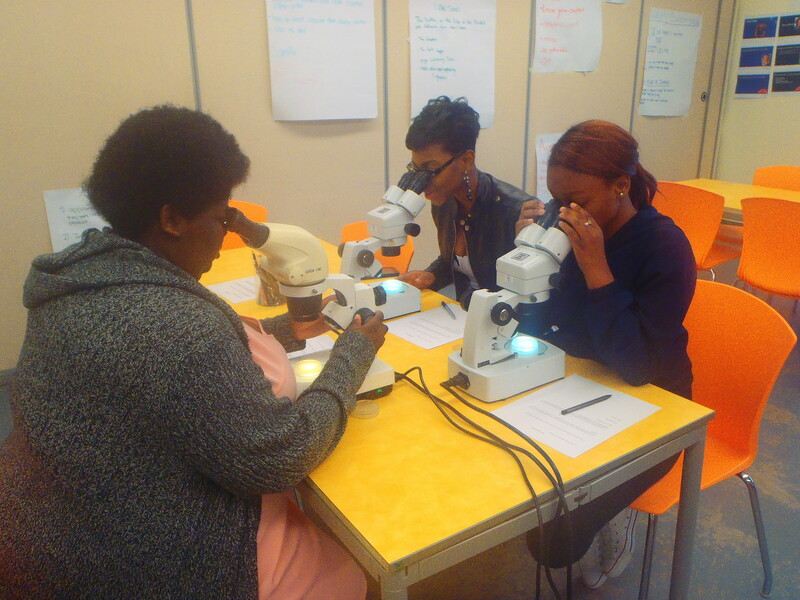 Our large teen program, Youth Exploring Science (YES), is a youth development program mostly for underserved teens. The teen science cafés are a great way to get these teens more involved in science careers, leadership, etc., but we also wanted to serve a greater diversity of teens. 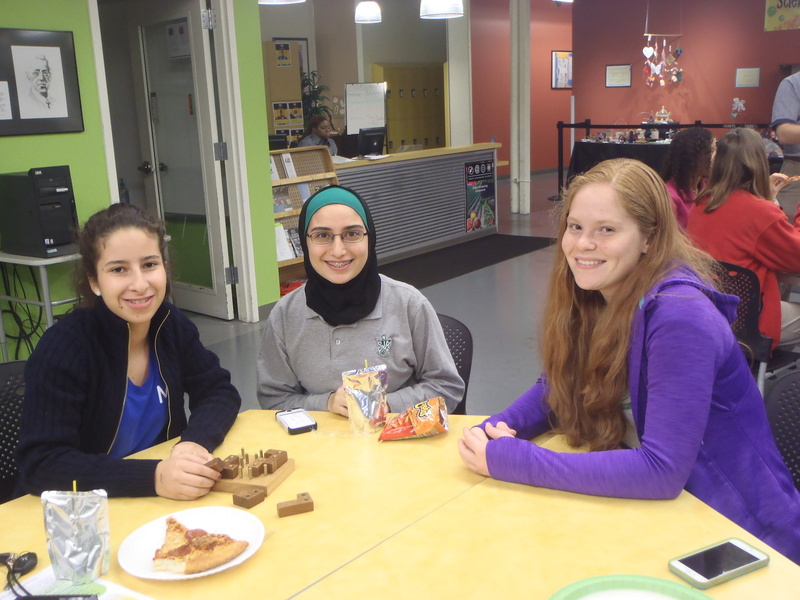 Our café program recruits teens from all over the city, including homeschoolers and Science Center members. This gives us an opportunity to provide programming for teens all across the metropolitan region. Funding. When our original grant ran out, we created some funding plans with one of the Science Center’s grant writers. We put together a proposal and sent it out to a number of organizations, but we have not received a positive response yet. We are also trying to get smaller donations, such as food, for individual cafés. Funding has been a continuous effort. By the way, we’re open to suggestions! Everyone loves the zombie cafés, but I also loved a café located at a local university, St. Louis University. Not only did the teens get to play with the College of Aviation’s big toys, tour their labs, and become immersed in aviation through simulators, but the teens also had the opportunity to experience a university campus. Many had never been to a college before and were blown away by the beauty of it. I think it really inspired a lot of our teens to look at more colleges. One of the best things is bringing teens from many different backgrounds together. The YES teens, homeschoolers, and other leaders, along with teens from the Academy of Science and Cahokia High School, all have fun together and work together beautifully. They plan and run the cafés, but they also work together on dry runs, train together each fall, and celebrate together at the end of the school year. All the teens are brought together by their willingness to lead and their dedication to other teens. One of the hardest things for me is letting go and letting the teens do most of the work. It’s so hard to let them work things out on their own without stepping in to help unless they absolutely need it. But teens learn to take the reins very quickly and have so much creativity. They really make each café more unique and engaging. Thank you Kerry! We look forward to hearing more about the Gateway Teen Science Café.